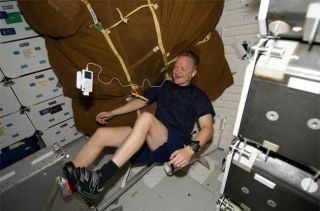 The space shuttle exercise bike, or cycle ergometer, on Discovery is similar to this one used by Endeavour shuttle pilot Eric Boe during a Nov. 2008 spaceflight. A new software package that simulates the biomechanics of the human body could help researchers develop better exercise programs for astronauts traveling to Mars or the moon. Astronauts currently use specially designed exercises to keep their bodies strong in space. Certain regimens can significantly reduce these three main vulnerabilities by targeting specific anatomical areas. Researchers at the University of Washington’s Computational, Robotics and Experimental biomechanics (CoRE) lab are using simulations powered by sophisticated software to better understand how astronauts move in space. They are focusing especially on the hip, which is prone to bone mineral loss in zero gravity. The team hopes their findings will lead to more effective exercise programs for astronauts undergoing long duration missions, such as to Mars or the moon. Since the forces experienced by the body in space are not easy to directly measure, CoRE lab researchers are using MSC Software’s MD Adams and a software plugin called LifeMod to simulate these biomechanical stresses instead. With this software combination, experimenters can estimate the hip joint contact forces during exercises at varying levels of gravity and better understand how reduced gravity affects the human body. LifeModeler, the company that makes the LifeMod software, is already working with NASA and researchers at UCLA to use their technology to develop a simulated walking exercise that addresses all three degradation concerns. The ideal walking exercise would send weight throughout the body, from head to toe. To achieve this in a zero gravity environment, the body has to be weighted artificially with bungee cords or other strapping mechanisms. This part of the program addresses the bone and muscular components, but to protect the neuromuscular system, the exercise also has to move the body in some kind of rhythmic pattern, similar to walking. “Your neuromuscular system is like a feedback controller — it’s got to be sent to something and it has to respond to something,” said Shawn McGuan, founder and CEO of LifeModeler Inc. In the 1960s the Russians created a rudimentary contraption to address these concerns, McGuan noted. The "Russian boot" would fill up with air when the astronauts’ feet brushed the ground, evoking the sensation of firmly planting them. As the astronauts slept, the boots would continue their work, "moving" the legs like they were walking. This story was provided by TechNewsDaily, a sister site of SPACE.com.